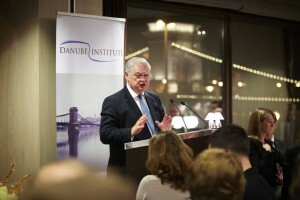 Lord Lamont in Budapest. Photo: Pócza Kálmán. The Lord Lamont of Lerwick, Britain’s Chancellor of the Exchequer in 1990–3, said in Budapest at a conference on the 2008 international financial crisis 15 November 2013 that invoking the anti-terrorism law against Iceland, as the British Labour government then did, was “a disgrace”. He added that he wanted to apologise on behalf of all those British citizens who sought to treat Iceland fairly. Lord Lamont asked for the floor after a lecture by Professor Hannes H. Gissurarson where he described how the British Labour government had closed the two Icelandic-owned banks in London, five minutes before it presented an immense rescue package for all other banks in Britain, and how that government had invoked the anti-terrorism law against one of the Icelandic banks with the consequence that all other Icelandic businesses and institutions were paralysed in their hour of greatest need for help. Gissurarson in Budapest. Photo Pócza Kálmán. 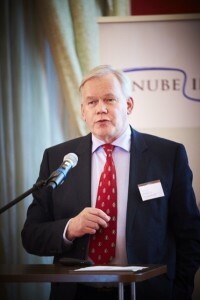 In his lecture, Professor Gissurarson had rejected some common explanations of the 2008 Icelandic bank collapse, such as that the regulatory framework had been less stringent in Iceland than in other European countries, and that the banks had become too big and that the Icelandic bankers had been reckless. The Professor pointed out that the regulatory framework was the same as in other member countries of the European Economic Area, EEA, and that the relative size of the banking sector was similar in Iceland to that in Belgium, Switzerland and the United Kingdom, and that bankers in other countries had proven quite reckless—indeed so reckless, that they had to be bailed out at an enormous cost to the taxpayers, with the help of the American Federal Reserve System which injected a lot of money into the European financial system. Professor Gissurarson said that in 2008 the Icelandic banking sector had been particularly vulnerable because of two systemic risks. First, cross-ownership was extensive in the Icelandic economy, and in the second place, the field of operations for the Icelandic banks was, because of the EEA agreement, much greater than their field of institutional support which turned out, in the end, to be Iceland alone. Into this already vulnerable sitution three crucial decisions entered and brought about the collapse: the refusal of the American Federal Reserve System to make the same kind of currency swap deals with Iceland’s central bank as it made with the central banks of the three Scandinavian countries, Sweden, Denmark and Norway; the decision of the British Labour government to close the Icelandic-owned banks in London while all other banks were saved by an immense rescue package; and the invoking of the anti-terrorism law against Iceland—an old ally which did not even have a military force. Those three decisions still had to be fully explained.